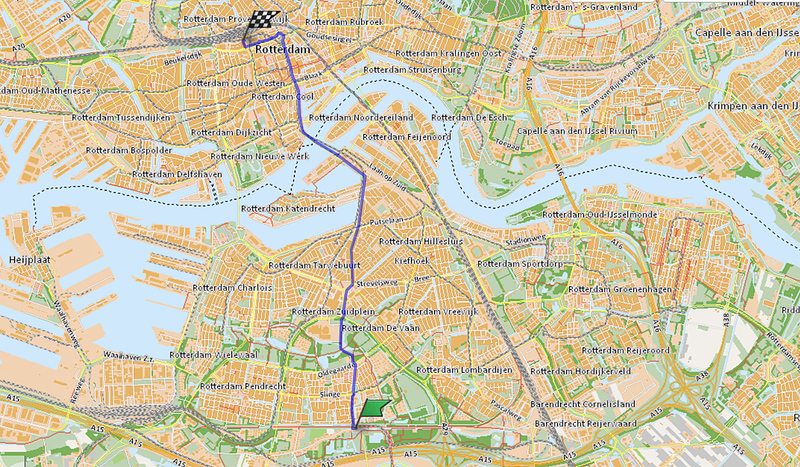 An 8-kilometre-long ride through Rotterdam, from the edge of the city in the South, all the way to Central Station. The ride was filmed in one take, to show you some great cycling infrastructure. That’s this week’s post in a nutshell. The very busy city centre of Rotterdam. 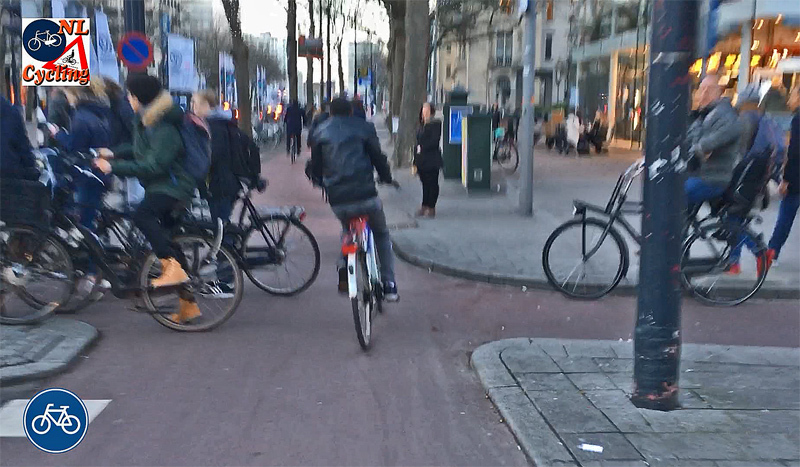 This is a bicycle traffic jam at Hofplein. On one of my many recent visits to Rotterdam I had the opportunity to film this ride. 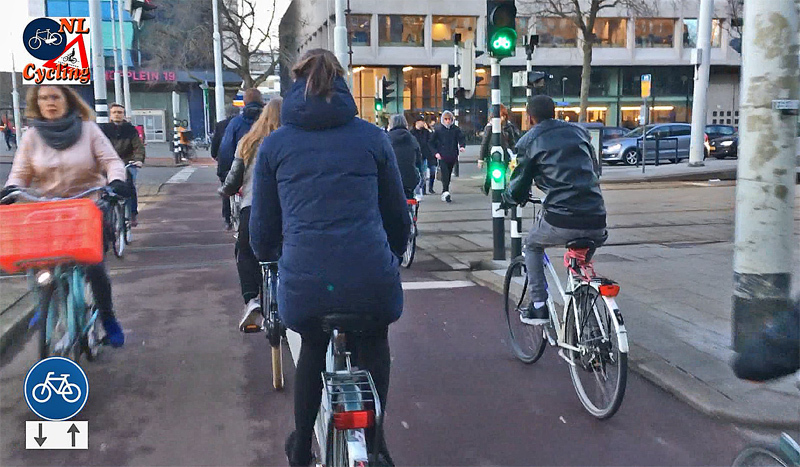 It will show you what it is like to ride in the Netherlands’ second largest city. This was filmed on a Friday, late afternoon, from 16:45 to 17:15. It is clear that rush hour starts at about that time. 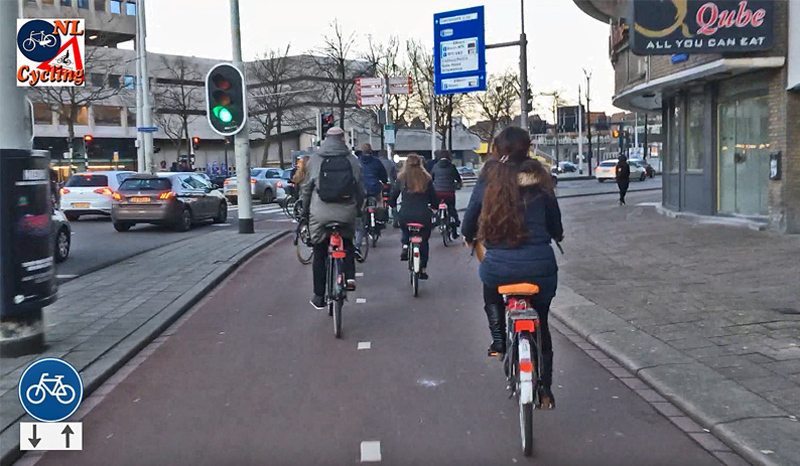 Especially near the end of the video, in the city centre, it is very busy; not only with cars, but also on the cycle paths. 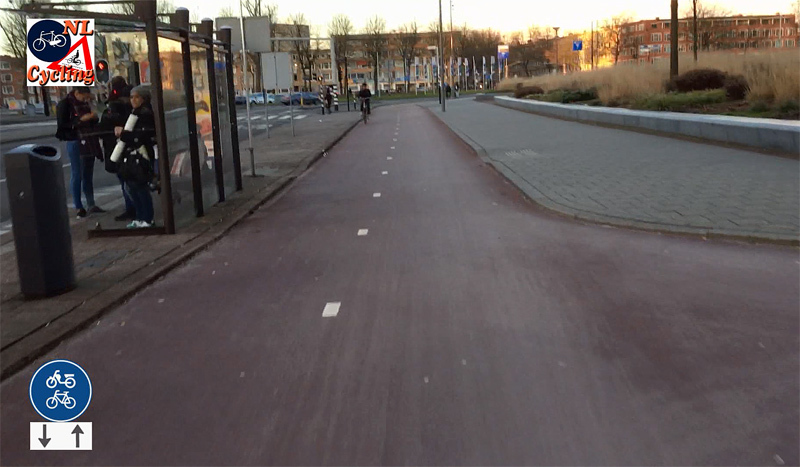 A unidirectional cycleway in Rotterdam. 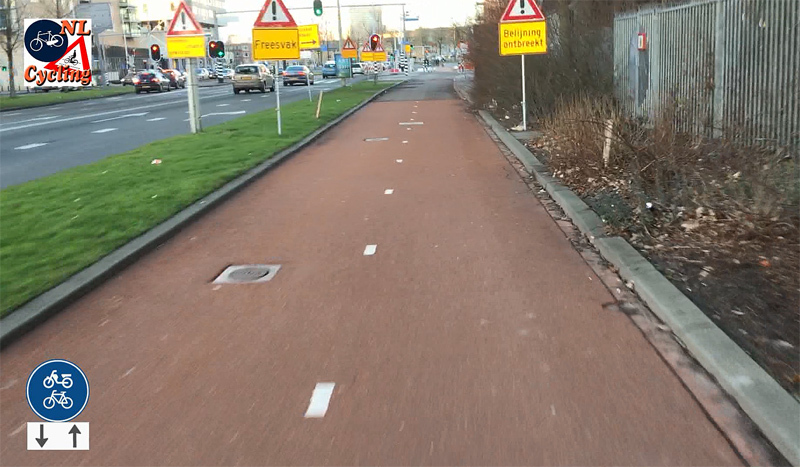 A bidirectional cycleway in Rotterdam. This is one of the main cycle routes into the city. The sign posts call it cycle route number 5. 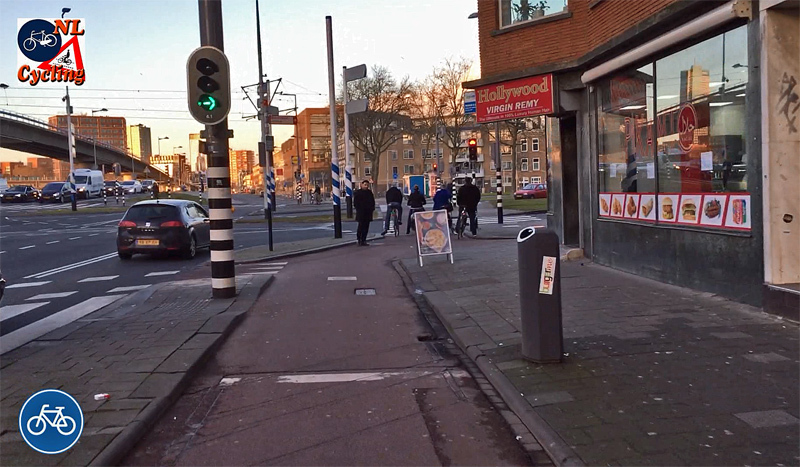 My video starts at the corner of Charloisse Lagedijk and Langenhorst. 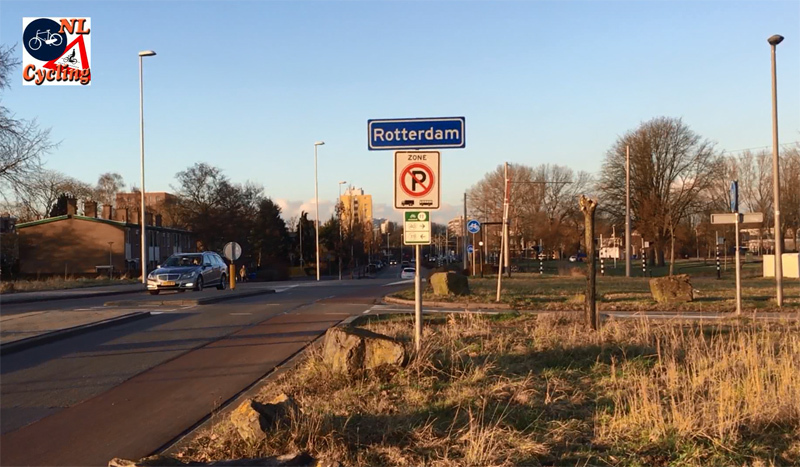 Officially that is in Barendrecht, but the sign with the name Rotterdam indicates that you are in Rotterdam very quickly from that point. The route takes us due north on Langenhorst, a road with unidirectional separated cycle paths on either side. Just north of the first roundabout (with priority for cycling of course) is a counting point for cycling. The figures for this point are mentioned in the latest cycle plan for Rotterdam. On a weekday, a very modest average of 573 people pass here on a bicycle. Signs announcing road works, also on the cycleway. The entire asphalt layers are gone, but there still is no “Cyclists Dismount” sign. It was perfectly possible to cycle on this road base. The route takes us through the Zuiderpark and then alongside some very large roads. All of which have protected cycle paths, mostly bidirectional on both sides of the road. The route for motor traffic even has a number; the S122, mostly. Near the large intersection Zuidplein there were some road works on the cycle path. It was striking that an all too common sign was clearly missing; the “Cyclists Dismount” sign. That is no coincidence. Rotterdam has introduced 10 rules for contractors who do road work. Rule number 7 is interesting for cycling “Cyclists are not requested to dismount and provisions are to be made for pedestrians.” That means you shouldn’t see any “Cyclists Dismount” signs in Rotterdam. This rule was in place for a long time already, but it was not always observed. The city is now more alert when road works are authorised and that is clearly visible in the streets. There were many signalised intersections on this ride. Turning cars and people cycling get a different green phase most of the times. Also here. 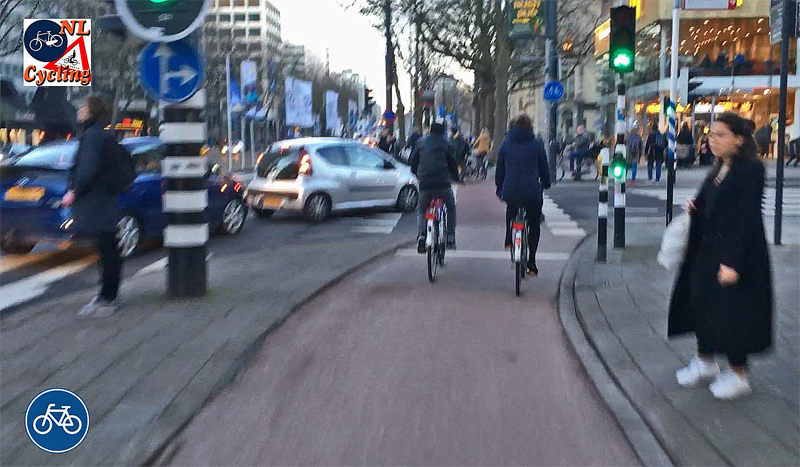 Where the green phase is not separate, motorists do wait patiently until all people cycling have passed. (Cycle) traffic going straight-on always has priority over turning traffic on the same road. 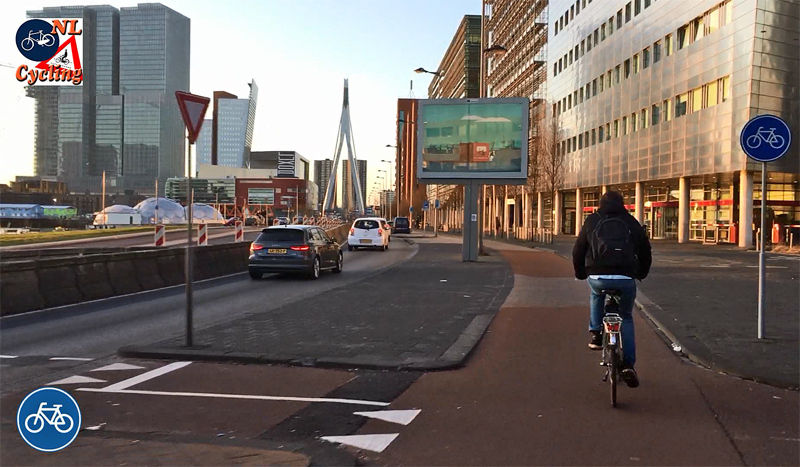 In Rotterdam South, at the Maashaven, there is another counting point for cycling. This location (much closer to the city centre) counts 2,522 people on a bicycle on average on a weekday. The route continues north and takes us over the Erasmusbridge. This is one of only a few points where you can cross the river and that is clearly reflected in the figures. An average of 10,968 people cross the bridge on a bicycle on a weekday. Far more than the first river crossing, the Maastunnel, that is used by 5,277 cyclists per weekday. I wrote about the Maastunnel before. The tunnel turned 75 years-old last 14th of February. 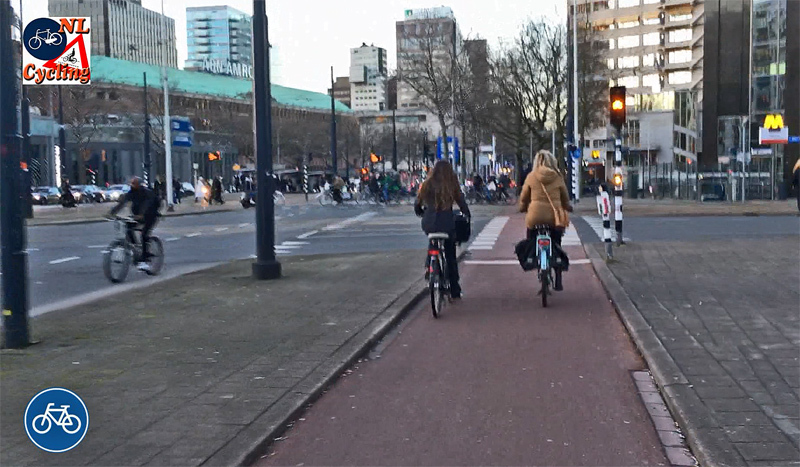 Most of the cycleways of Rotterdam have a surface of asphalt (580km of the 600km of cycle ways in the city). Unlike for instance cycleways in Germany, the cycleways in the Netherlands do not feel as if they are part of the sidewalk. They are a completely separate piece of infrastructure: not part of the carriageway, but also not part of the sidewalk. The number of traffic lights in Rotterdam is relatively high and you lose a lot of time at the lights. In this ride, I had to pass 14 signalised intersections. Not all the signals were red, but the total time I waited at red lights was 6 minutes and 6 seconds (26.1 seconds on average). On a total trip of 29 minutes and 27 seconds that is a very high percentage. I had to stop at red lights 19% of the time. Some of the waits were really long. This was the longest time at a red light. Not really an acceptable time, 1 minute and 51 seconds! 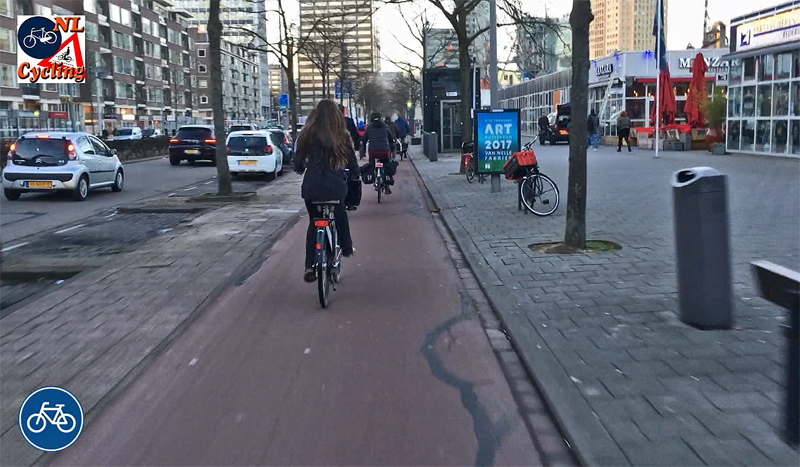 A very busy bidirectional cycleway in the centre of Rotterdam. The longest wait was at the bottom of the Erasmusbridge with a red time of 1:51! I am really not used to such long waits and so many lights in ʼs-Hertogenbosch. And that is also why it went wrong at one of the signals. I ran a red light. Inexcusable, of course, but I am going to explain why it happened. The crossing of Blaak has a light in the central reservation. Such lights are uncommon, but when they do exist they are usually coordinated. I did not expect it to turn red any time soon for that reason. As I was approaching that second light, someone took a shortcut on the carriage way and that distracted me. While the camera kept pointing at the light turning yellow, I was looking at what that guy was doing. When I turned my eyes back to the light it had turned red, but it was too late to stop safely, so I continued. That does seem the better choice: instead of coming to a standstill on the carriage way, I now made it to the other side of the road in time. The man in the left-hand side of the picture is riding on the wrong side of the road on the carriageway. Going against traffic where he is not even allowed to cycle. I had my eyes on him and not on the signal ahead. I never saw it change (I also didn’t expect it to change so quickly) and that is why I went through red here. I wasn’t the only one going through a red light that day. The driver of this tram clearly did something wrong as well. Near the end of this journey, in the city centre, you can see that it is clearly rush hour. The cycle paths are very busy and the paths are used at their maximum capacity. There is just space enough for people to wait for turning lights for instance. The final street I cycle on is Weena. That street has a counting point for cycling as well. On a weekday, some 8,247 people pass through here on a bicycle. 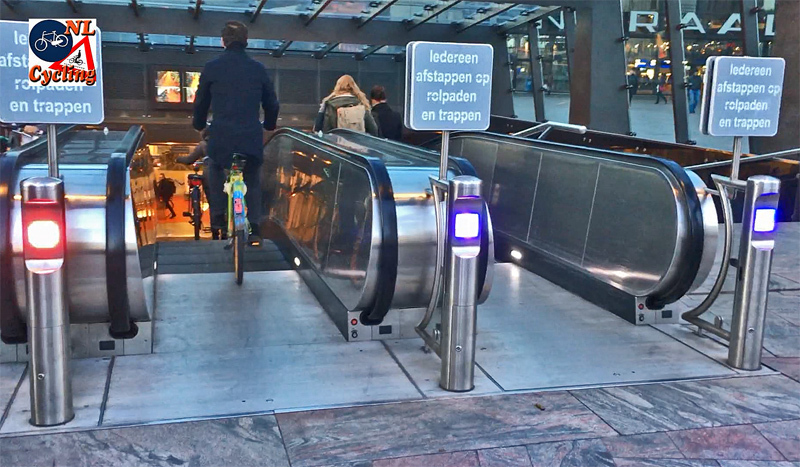 But even in rush hour, the entrance to the underground bike parking facility at Rotterdam Central Station can be reached in a fairly convenient way. I handed back the OV-Fiets I hired from there and I returned home to ʼs-Hertogenbosch by train. The cycleways are barely capable to handle the volume of cycle traffic in rush hour. There is just space enough to pass other people waiting for the light to change in another direction. The entrance of the underground bicycle parking facility at Rotterdam Central Station. The entire route. Picture from the route planner of the Cyclists’ Union. The route is very straight forward. The sped-up version of the ride (3 minutes). The ride in real time (29:44m). The signaling at Erasmusbrug is a mess and the whole crossing has always been a mess. It’s only going to get worse with the Maastunnel closing for two years. There’s simply not enough room at the crossings for the volume of cyclists, not just during rush hour but also in the weekends. The tram driver did nothing wrong. 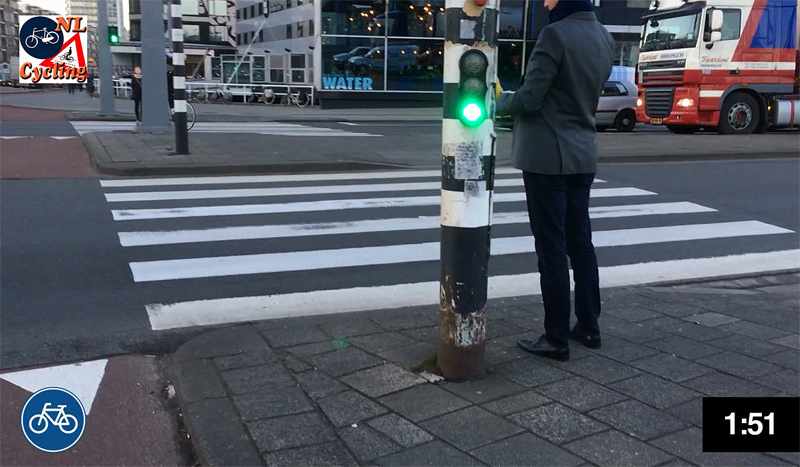 A green signal (or white bar negenoog signal) gives you the right of way to enter the intersection. Once you do so, you have right of way over other traffic until you exit – even if that traffic faces a green light. 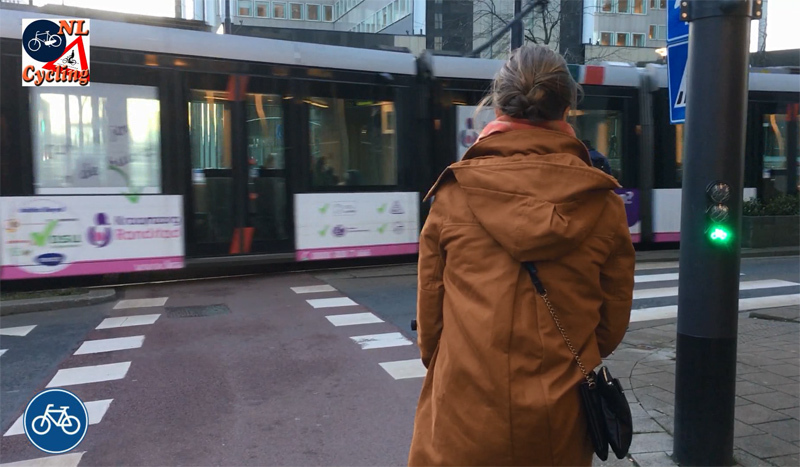 I can’t speak for Rotterdam, but in Toronto tram signals are timed to get the front of the vehicle through the intersection – not the back. Once all the conflicting paths are obstructed by the tram, those other lights can safely turn green. People are not stupid, they won’t start moving before their path is clear! That way there is no wasted time between when the tram clears and when conflicting traffic starts moving. In the video, the light turns green a couple seconds before the back of the tram is out of the way, which seems just about right. It gives the lady in front just enough time to start moving, then by the time she reaches the tracks, the tram is out of the way! With on-street parking on a busy thoroughfare and elevated trains this is as close to an American city in design as any Dutch city. Los Angeles County has a new forever one-cent sales tax for transportation that starts July 1st. The listed projects are only for the first 40 years. They intend to borrow against future earnings to start as many projects as possible all at once. The LA city council will vote whether to set aside 10% of the local return for active transportation. If this occurs I would expect bicycling to increase by double digits every year. Well, come back after the summer, as they’ll be closing the Maastunnel, used by 75.000 cars a day, at least, for renovations that will be lasting for two years. I’m sure you’ll be able to shoot some interesting footage. It’s great bicycling everywhere in The Netherlands. Everything comes together to make it what it is – the flat land, climate, health conscious, practical and prosperous people. It’s no wonder that the Netherlands is one of the “happy countries”. The junction at the north end of the Erasmusbrug: I remember this being a long light as well. I think this is because the city prioritizes car traffic here. There are so many lanes here! IIRC, there are even double turn lanes, and so the city is trying to move as much traffic as possible to prevent a backup on the bridge (which only has one lane in each direction). Weena: I remember this light being short because the signal phases rotated quickly around the junction. This intersection doesn’t have nearly as many lanes as the junction at Erasmusbrug. I think it also has more pedestrians because of the Metro station and the shopping center on two corners of the junction. Each junction also has trams making turns! 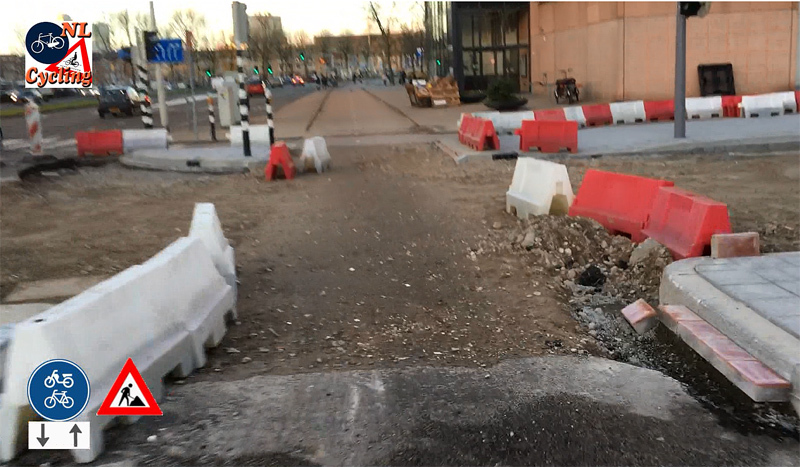 This entry was posted on 14 March 2017 by Bicycle Dutch in Original posts and tagged infrastructure, long distance cycle paths, ride, Rotterdam.